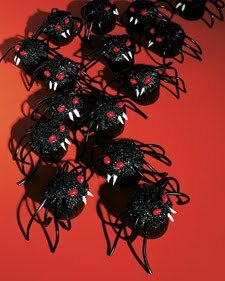 Who knew Martha Stewart had a dark side? 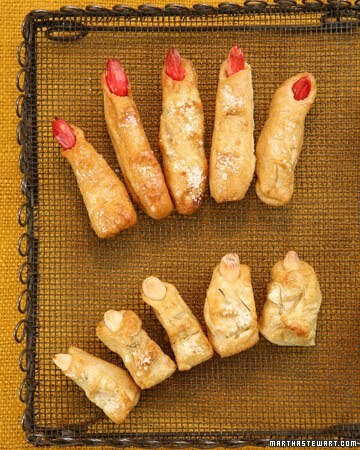 She’s a ghoul after my own heart, with these creepy recipes! 1. In a medium bowl, whisk together soy sauce, oyster sauce, sugar, black bean sauce, and food coloring. Set 1/3 cup soy sauce mixture aside. 2. Place chicken wings in a large resealable plastic bag and pour remaining soy sauce mixture over wings; seal bag. Turn bag until wings are well coated. Refrigerate, and let marinate for at least 2 hours and up to overnight, turning chicken wings every 30 minutes to coat. 3. Preheat oven to 375 degrees. Line 2 baking sheets with parchment paper or a nonstick baking mat; set aside. 4. Remove wings from marinade, shaking off any excess; discard marinade. Place them in an even layer on prepared baking sheets, arranging them so that wings are extended. 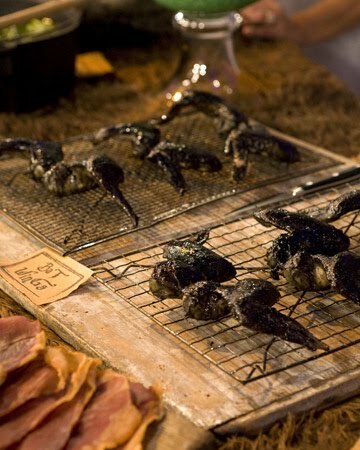 Bake until juices run clear, 20 to 25 minutes, brushing with reserved soy sauce mixture every 10 minutes. Remove from oven and brush with any remaining soy sauce mixture. Let cool slightly on a wire rack before serving. 2. Pour 2 cups water into the bowl of an electric mixer fitted with the dough-hook attachment. Add sugar; stir to dissolve. Sprinkle with yeast, and let stand until yeast begins to bubble, about 5 minutes. Beat in 1 cup flour into yeast on low speed until combined. Beat in coarse salt; add 3 1/2 cups flour, and beat until combined. Continue beating until dough pulls away from bowl, 1 to 2 minutes. Add 1/2 cup flour. Beat 1 minute more. If dough is sticky, add up to 1 cup more flour. Transfer to a lightly floured surface; knead until smooth, 1 minute. 3. Coat a large bowl with cooking spray. Transfer dough to bowl, turning dough to coat with oil. Cover with plastic wrap; let rest in a warm spot to rise until doubled in size, about 1 hour. 4. Preheat oven to 450 degrees. Bring 3 quarts water to a boil in a 6-quart straight-sided saucepan over high heat; reduce to a simmer. Add baking soda. Lightly coat two baking sheets with cooking spray. Divide dough into quarters. Work with one quarter at a time, and cover remaining dough with plastic wrap. Divide first quarter into 12 pieces. On a lightly floured work surface, roll each piece back and forth with your palm forming a long finger shape, about 3 to 4 inches. Pinch dough in two places to form knuckles. Or, to make toes, roll each piece so that it is slightly shorter and fatter, about 2 inches. Pinch in 1 place to form the knuckle. When 12 fingers or toes are formed, transfer to simmering water. Poach for 1 minute. Using a slotted spoon, transfer fingers to the prepared baking sheets. Repeat with remaining dough, blanching each set of 12 fingers or toes before making more. 5. Beat egg with 1 tablespoon water. Brush pretzel fingers and toes with the egg wash. Using a sharp knife, lightly score each knuckle about three times. Sprinkle with sea salt and rosemary, if using. Position almond nails, pushing them into dough to attach. Bake until golden brown, 12 to 15 minutes. Let cool on wire rack. Fingers and toes are best eaten the same day; or store, covered, up to 2 days at room temperature. If you need some assistance with your digits, Martha has an instructional video here. 1. Combine beans, salt, onion, jalapeno, chipotle, garlic, and lime juice in a bowl. 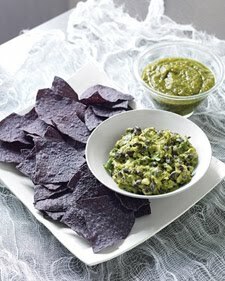 Mash avocados; stir into bean mixture with cilantro. Serve immediately, with chips. 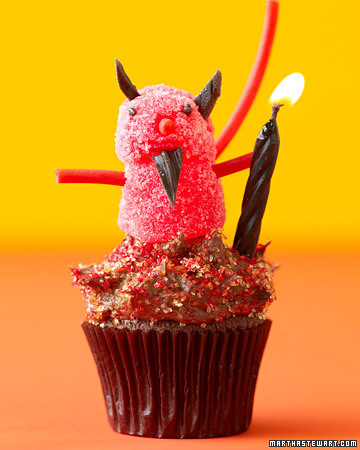 To make this delicious devil, you'll need two red gumdrops, red licorice for his arms and tail, black licorice for ears and beard, and two black sprinkles for the eyes. A black candle serves as this trickster's flaming staff. 1. Pour batter from chocolate cupcake recipe into 2 1/2 mini muffin tins with paper liners. 2. Ice mini cupcakes with vanilla buttercream and coat icing with black sanding sugar. Use cinnamon candy for eyes. 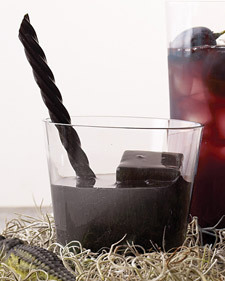 For legs, attach 8 pieces of black licorice. For fangs, cut out tiny cone shapes from a marshmallow and attach. 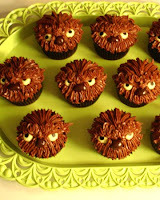 No recipes provided for these werewolf cupcakes, but they’re so cute I thought I’d include them. 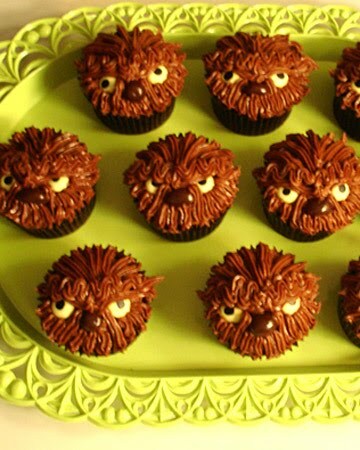 I’m sure they’re easy to replicate - squirt some frosting to resemble fur, add some eyes. And devour! To get the full effect (on this or any other photo), click on the pic for a larger view. For those 21 and older, a steamy little drink will wash down those appetizers. 1. Combine vodka, syrup, and juice in a cocktail shaker, stir to combine. Add seltzer, and divide between two glasses filled with licorice ice cubes. Serve immediately. 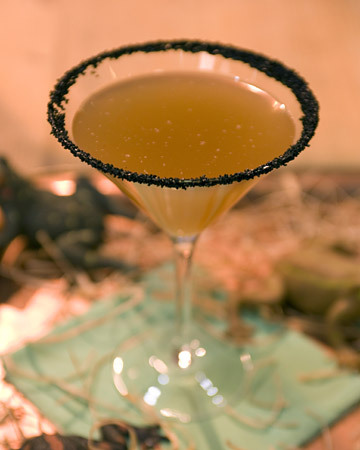 I actually mentioned these drinks in my recently finished fantasy, The Magic of Lavender. I just began shopping for a suitable pub for it, so wish me luck! 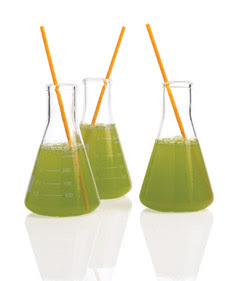 These beverages (actually kiwi-based refreshers) look pleasingly poisonous in any glass, but, perfectionist that she is, Martha suggests serving in chemistry flasks, available online from lab suppliers for a few dollars apiece. 1. In a glass measuring cup, pour 1 cup boiling water over 1 cup sugar. Stir until sugar has dissolved; refrigerate until cool. 2. Puree 2 cups packed mint leaves (1 small bunch) with 1/4 cup cooled syrup in a blender. Add 6 peeled, quartered kiwis, and blend until just smooth. Add remaining syrup. 3. Pour through a cheesecloth-lined fine sieve into a pitcher; discard solids. Stir in ice and 1 liter sparkling water or club soda. (For a cocktail version, add 1 cup vodka.) Pour into flasks, and serve with straws. Makes 8 drinks. The Halloween magic continues tomorrow! More great guests scheduled in the weeks ahead, so be sure to check back.